In our last podcast I ran some analyses on the vegan pledge data that Chrissy from London Vegan Campaigns was so kind to give to us. To summarize, LVC has been running a pledge every year since 2008. Each year pledgers come to the first meeting and are introduced to vegan food and nutrition including health checkups and cookery lessons. You can see more about what the campaigns do for pledgers at the London Vegan Campaigns website. Pledgers are all assigned mentors who will help them during their month long pledge. Data is collected on pledgers during the first meeting, during the end of the month meeting and, for past pledges, one year after. I divided a lot of these analyses between 2009/10 and 2011 because the questionnaires changed quite a bit. Ever talked to someone about a vegan diet and they say “I could never give up cheese!”? Well, we found some longing for dairy in our data. I might mention that these are spontaneous responses that I coded into categories and the numbers on the left are the percentage of participants who mentioned each category of challenge (they are also not mutually exclusive). Dairy scores second next to convenience and eating out. While around 20% of participants reported missing some kind of dairy only one person reported missing anything else (this was eggs). At the end of the 2011 vegan pledge 104 participants answered what foods they missed/craved most during the pledge. This was also pretty skewed with dairy mentioned in 67% of responses versus all other foods (including eggs) mentioned in 42% of responses (including some people saying they missed both dairy and other foods and several people saying they would miss nothing). Gradual transition or “cold tofu”? We were interested in whether or not people who began as vegetarians would be more successful than pescetarians (those who eat fish, bivalves, molluscs etc. but not birds or mammals) and omnivores. Vegetarians are already familiar with eating differently than most of those around them and eat fewer animal derived foods than the average person. I pooled all the data together here* of those who both answered questions about what they ate at the beginning of the pledge and if they decided to stay vegan at the end of the pledge. All together this was 122 pledgers, 41% vegetarian 21% pescetarian and 31% omnivore. Check out the (completely gratuitous) graph. 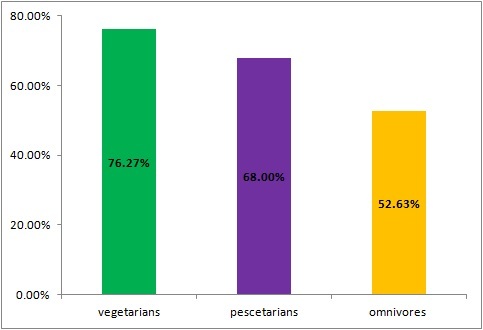 You can see that omnivores were less likely to decide to stay vegan compared with pescetarians and vegetarians, but is it statistically significant? Well, if I hadn’t been too lazy to put in error bars you might have been able to tell by yourself but statistically, vegetarians are significantly (α=5%) more likely to stay vegan than omnivores. Pesce’s were somewhere in the middle and didn’t statistically differ from either of the other groups. Keeping in mind that there’s going to be a selection bias in who attends the last meeting (those who majorly fall off the vegan wagon are unlikely to stick around and fill out the end of month questionnaire) the rate at which people decide to stay vegan is still pretty darn impressive. Finally, we have one year follow up data several of the 2008 and 2009 pledgers. 5/10 from 2008 and 18/25 from 2009 which means that 66% stayed vegan – which isn’t including whole families that became vegan along with a mother or father. Well done London Vegan Campaigns! In the next blog I’m going to talk about the effect of reasons for going vegan, vegan buddies (or vegan booties as Ian pronounces it) and the paradoxical effect of unsupportive people.